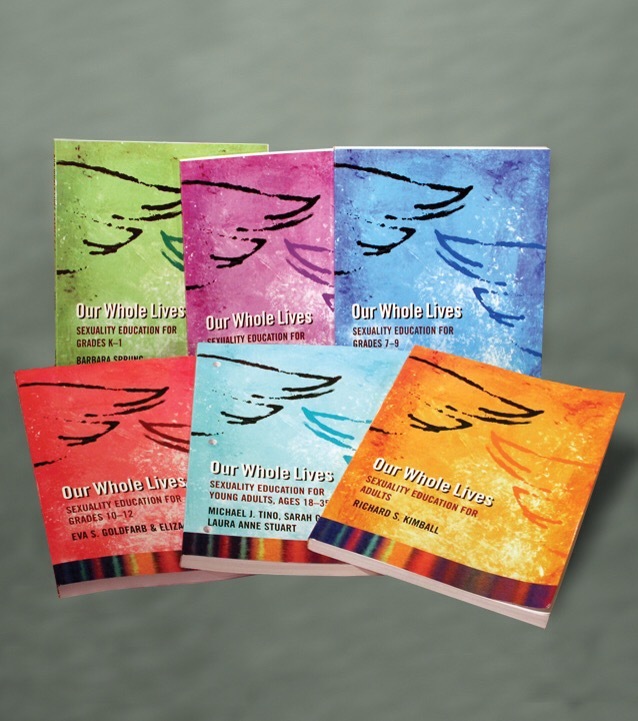 Our Whole Lives is a comprehensive sexuality education curriculum available for six different age levels (grades k-1, grades 4-6, grades 7-9, grades 10-12, young adult, and adult), developed by the Unitarian Universalist Association (UUA) and the United Church of Christ (UCC). This program can be combined with the Sexuality and Our Faith supplements, available for each level. In-depth training sessions are available for would-be facilitators of the program, that usually take place over one weekend. Training sessions provide facilitators with a strong understanding of the Our Whole Lives values, key facilitation and implementation skills, tips on teaching about critical topic areas, and an opportunity to practice through peer facilitation. Check out the list of upcoming trainings on either the UUA or UCC training list websites. The Sexuality and our Faith supplement includes an optional visual component for the grades 7-9 and 10-12 levels, available to facilitators from UUA or UCC congregations who have attended an OWL training and are approved by their Trainers. While designed by the UUA and UCC, the curricula can be implemented in either faith-based or secular settings- any faith-based material is only included in the supplemental material. Note, the lesson plans in the curricula for grades K-1, 4-6, and 7-9 are intended to be used sequentially and in full. The lesson plans in the grades 10-12, young adult, and adult programs can be more loosely implemented, using the audience to identify which topics will be included in the program to meet the needs and interests of the group. The Our Whole Lives program is not only well crafted and intentionally written, it is respected in the field of sexuality education as a model curriculum. It is easy to use for even an inexperienced facilitator, and engages participants in critical thinking while also providing key information. In addition, the OWL values make it clear that the program stands for something, and that something will hopefully help participants be healthy sexual beings. Plus, this is a comprehensive program that provides age-appropriate learning for people of ALL ages, because we are sexual beings from the moment we come into existence until we die, and we all need to explore this complex topic of sexuality throughout our lives- not just once (or even just twice). We bend and grow and stretch all the time, let’s do that with our sexual development, too. I also have a strong personal connection to this program. I am a facilitator for all six age levels and a Trainer for middle/high school and adult/young adult levels, and has informed my personal and professional development in profound ways. Of course I selected this resource as my first resource highlight! Visit the UUA Bookstore or the UCC website to purchase the curricula and/or supplements. Cost of the curricula are $40 (grades K-1, 4-6, young adult), $60 (grades 10-12, adult), and $75 (grades 7-9). Supplements range from $8 to $18.